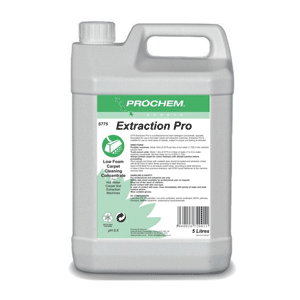 Prochem Extraction Pro is a professional low foam emulsifier. For use in carpet soil extraction machines. Effectively penetrates & suspends soils for complete extraction – prevents re-soiling. Fluorescent green liquid with a citrus fragrance. Extraction Pro is extremely cost effective product to be used in both a domestic or commercial environment. Sold in 5 litres.